Effective immediately, OnStar’s MyLink App will be ready to use on several (though select) 2010 Chevrolet, Buick, Cadillac and GMC models. Avalanche, Impala, Suburban, Tahoe, Traverse. Note that the 2010 Malibu and Camaro are absent. DTS, Escalade, ESV, EXT. Unfortunately the hot-selling 2010 SRX and CTS models — which make up the bulk of Caddy’s sales — are not compatible. Enclave. Sorry, No 2010 LaCrosse. We find it good that OnStar is extending its Mobile App compatibility, but its missing several 2010 models that sold very well. More unusual is the fact that the 2010 GMC Yukon missed the cut but the rest of the GMT900 SUVs such as the 2010 Escalade and Suburban are now compatible! Update: the Yukon/Yukon XL is now compatible! And how about the GMT900 trucks like the Chevy Silverado and GMC Sierra? Let’s hope they’re coming soon! Why don’t they make this feature available for the Corvette. Good question. Seeing how it’s Chevy’s most premium vehicle, it should be a no-brainer. Hoping for more updates soon! I cannot believe that this app does not support the 2010 Cadillac SRX!! This model was one of Cadillacs best sellers, and they’ve seem to just exclude it! I’m extremely disappointed!! Darrell – looks like all of GM’s Theta-based crossovers – including the Equinox, Terrain, and SRX – didn’t make the cut. Hopefully it’s in the cards – those were GM’s most popular vehicles in 2010! I just bought a 2010 LT Silverado that is loaded. Bluetooth and every other bell and whistle except for navigation. I have turn by turn which is good enough for me. No MyLink though. What the hell is wrong with this company? I drive a Crew Cab pimped out ride and can’t even get the MyLink. GM is run by a bunch of Fags! Research… that’s all I have to say… And what a great way to express yourself! They have now added the 2010 Yukon. Has anyone been able to get it to work on the 2010 Yukon Denali? I am having trouble getting it set up. April, we’ve put in a question to GM about MyLink availability in the 2010 Yukons. While we wait for a reply, what issues are you having with the set up? Thanks, I really appreciate it!! Sure thing Eric. We’re still awaiting a reply from the folks at OnStar and Caddy. I emailed OnStar from their website and asked if it was available on my Yukon Denali. They quickly replied and said it was now available for for the 2010 Acadia and Yukon. I downloaded the app and it connected to my vehicle right away. However, I can’t get the remote access set up. My vehicle came with factory installed remote start, so it should work. The app says I must go online to my account and allow remote access. However, when I go online, it says that MyLink is not available on my vehicle. I have spoken with a couple of different advisors about this and can’t seem to get anyone to help. They tell me it will only work with the regular Yukon…not the Denali. It doesn’t make any sense. I’ve read several app reviews where people have gotten it to work with the 2010 Denali. I think it has to do with the way they have my account setup online, because they do not have the word Yukon in my vehicle description. But I can’t get anyone to help me. Do you have any advice about contacting OnStar and getting better results? Please disregard my last message. Just now when I logged in to my account it allowed me to turn on Remote access, and it worked like a charm. After my persistence with OnStar about my account, they finally got it fixed. Very excited. And I got 3 free months service for the inconveinence. Thanks OnStar! That’s awesome April! Looks like we’ll need to issue an update to this story as well as write a new one for all the Yukon owners out there! Thanks Alex, and I will continue to be a loyal GM Authority reader, I’m just hoping for some of that good news some other readers are getting. I want the full effect of being a GM owner not to mention a loyal OnStar subscriber. I have an 07 suburban that I would like to use the app with. Why isn’t available for for my vehicle? I’ve got the app and the vehicle, all I need now is for Onstar to do their part. Manny — don’t get your hopes up. 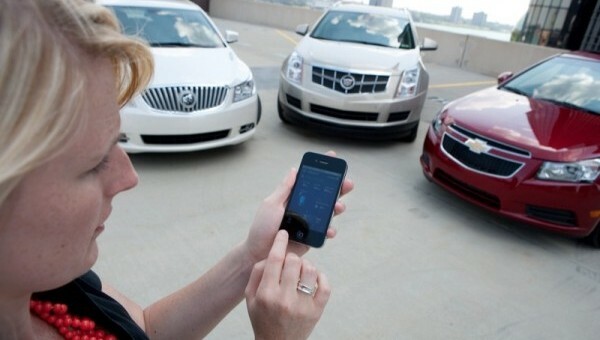 Your ’07 has the old OnStar hardware… and when you bought your ‘burban, the apps weren’t even in existence. I think the best thing GM could do is make an OnStar upgrade kit available so owners that are in your situation could buy it and have it installed… I think that’s the only fair way to do it. What do you think? Hi Alex. I’ve been in contact with onstar customer care through phone calls and through emails and they told me in all those instances that my 2010 GMC Sierra SLT would be compatible with the Mylink sometime in 2011. Is that still going to happen. They seemed quite certain when they told me that. Thanks for you help. That’s great. We’re hearing some rumblings about the Sierra and Silverado on our end as well. There will be another update — they’re just working on getting the apps compatible with the hardware installed in the vehicles. I just found this site for the first time thanks to Google, but what a wealth of knowledge! I have a 09 Tahoe hybrid, do you know what generation of onstar hardware it has? I have a free trial the dealer gave me while having some warranty work done but I’d pay for a subscription in a heartbeat if the mylink app would work with it! Any info on a possible update for a 09 Tahoe? As far as I know, the 2009 Tahoes have the eight-gen OnStar hardware as opposed to the 9th-gen required for MyLink to work. 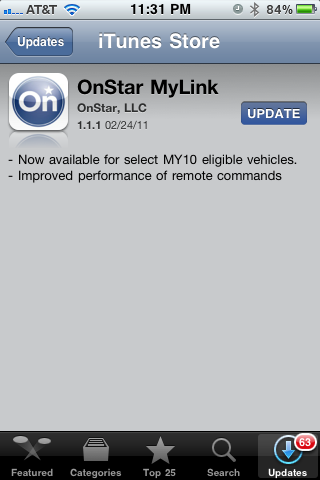 That said, if you have the OnStar trial, try downloading the OnStar MyLink app on either Android or iPhone — and see if it works. If it does — great! If it doesn’t, we hope OnStar/GM will offer an upgrade kit in due time to bring you up to 9th-gen hardware. Kevin, we’re meeting with some OnStar reps shortly. Should have some info then. We’ll be sure to update this comment thread when we know! Does anyone know what generation Onstar is in a 2009 Acadia? John — I think the ’09 Acadia does not have the 9th generation (which is the latest generation compatible with all the newest OnStar mobile services). I think it has the 8th gen.
We’ll double check with OnStar and get back to you here. Alex, did anything new about about the App for the 2010 SRX come out of the meeting? Any word for the 2010 Saturn Outlook XR-L. Yes I got one of the last made in 2010. It is loaded and has remote start. If it can give me turn by turn directions on a radio, Mylink should be no problem. Any info would be appreciated. Great site. Count me in as one of the folks looking to have the OnStar app work with the 2010 SRX. I love the car, the app feature would be great! We will be talking to a few people from OnStar tomorrow. Stay tuned – we’ll ask about app comparability with SRX, Equinox, and Terrain, Malibu, Camaro, and a few more models on our list. Hey Alex any word yet on the 2010 Equonox? I just found my 2010 Saturn XR has onstar gen 8.2. They say the difference between gen 9 and 8.2 is gen 9 has improved voice recognition. So you think it wouldn’t be that difficult to add gen 8.2 to MyLink. This would be a great feature to GM vehicles. This is site has been very helpful, lots of info. Any word on 2010 Saturns would be great. Keep up the great work.